We, the people of Bengal, are having the best time of the year right now. Because, the biggest festival of Bengalis, Durga puja is going on in full swing. All well-dressed people of all ages are on the road, walking mile after mile to experience some great art-work displayed in the puja pandals in almost every locality and off course to see the divine mother "Maa Durga". The puja organisers spend numerous time thinking of a theme or a message and then they start planning on pandal decoration like, what art-form they want to showcase. It's not a month or two job, they spend several months on planning and then executing the result, showcasing all kinds of artwork, from traditional to modern. Some feature a special thing and build a big pandal out of it in a very creative manner. Any kind of art form always attracts me and I love to see all those hardwork they put to showcase an art form. Me and my family hop from one pandal to another for hours and witness some amazing artworks in these four days. While on the road and walking miles after miles, you are bound to be hungry and thirsty. To satiate people's hunger and thirst in this humid weather, there are numerous food stalls are found on the both side of the road. Phuchka(gol-gappa), rolls, bengali chops(fried fritters), Momo, Biriyani, Ice creams and what not. The people of Bengal cannot think of a home-cooked meal these four days, as there are so many varieties of food to offer on roadside stalls or restaurants these festive days. This year the weather is hotter and while pandal hopping, I am just craving for something cold all the time. While looking for something cold, I found a roadside shop, which was selling Ice creams from various companies. While kids were opting for vanilla or mango flavour ice-creams, my eyes were struck upon a flavour, which I love from my heart. 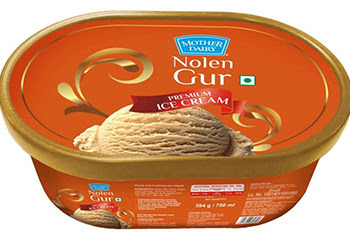 It was nolen gur ice-cream from Mother's Diary. I suddenly yelled, " I want Nolen gur Ice cream". I was acting just like a kid who was treated with an ice-cream after long time. And when its Mother Dairy, I don't opt for anything else. I use many of their products like milk, sour yogurt, paneer, cheese spread, cheese slices etc. Yes, Mother Dairy has recently introduced this flavour in Kolkata market. The reason of me being so happy is that I once tasted this same flavour of Ice-cream in a 5-star restaurant which was priced more than 300 rupees for a small bowl of ice-cream. When I found that Mother Dairy has launched the same flavour for lot more cheaper price, my joy was boundless and I screamed for my favorite ice-cream. Nolen Gur or date palm jaggery is quite popular in eastern part of India, specially among bengali people. 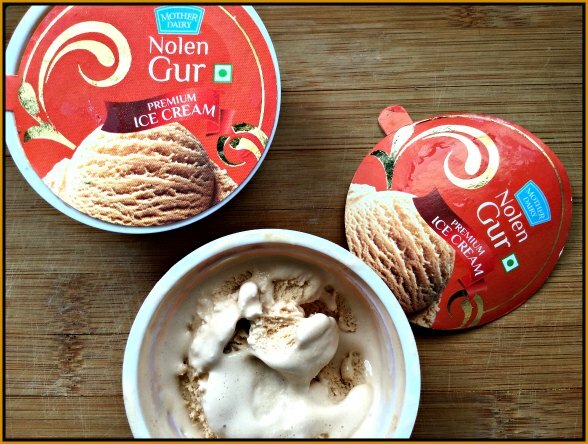 We love anything made with date palm jaggery or nolen gur. One spoonfull of this ice cream, and I forgot all my tiredness and roamed for some more time doing pandal hopping. Even my kids stole few spoon from me and they loved it. They made me promise that I have to bring home this ice-cream soon. Perfect blend of sweetness and flavour will take you to another world alltogether. Mother's Diary has made it in pack sizes of 750ml & 90ml and priced at Rs 150/- & Rs 20/- respectively. 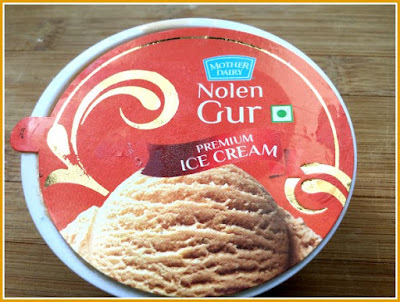 Treat your kids' ocassionally or serve your guests this nolen gur Ice cream at the end of a festive meal or just devour yourself. Choice is yours. It's going to be a regular in my home, that I'm sure. Disclaimer : This post is in association with Mother Diary.